The foundation of a successful high school advancement program is strong, enduring and positive relationships with all of our supporters from parents and students to alumnae and corporations. 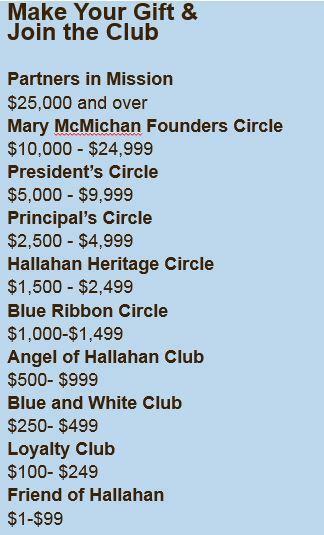 We value all of these partnerships and look forward to growing our Hallahan community to include even more individuals, businesses, corporations and organizations. Here are a variety of ways to support the mission of our school. In order to uphold the mission of John W. Hallahan Catholic Girls’ High School, we rely on the generosity of our extended community to fund various initiatives, as well as to provide need-based financial aid and merit-based scholarships. Gifts to Hallahan, whether current or deferred, large or small, help to ensure that the tradition of a Hallahan education can remain strong, and that all qualified students are able to pursue a secondary school education here regardless of their ethnic, religious, or socio-economic backgrounds. Make an immediate impact by donating online through a secure server. Or by mail - make checks payable to “John W Hallahan Catholic Girls' High School” attention Development Office, 311 N. 19th Street, Philadelphia, PA, 19103. Taking advantage of the matching gift programs is a great way to maximize your charitable donations. Many companies double or even triple their employees’ contribution for the benefit of a charity of the employee’s choice. To find out if your company has a matching gift program, contact your human resources department. Is your company able to provide products or services that will help with the operation of our school? We welcome gifts of in-kind materials and services. If your business, or a business that you are aware of, would be interested in learning more about partnership opportunities with Hallahan, please contact our advancement office at advancement@jwhallahan.com or 215-563-8930. If you want to use your IRA to make a charitable donation this year, you don’t have to wait for Congress to act. Just tell your IRA custodian to transfer the funds directly to your favorite charity. Before the end of this year, we expect Congress to retroactively reinstate the provision that expired after 2014 allowing people who are age 70 ½ and older to transfer up to $100,000 tax free from their IRAs directly to charity. So direct transfers anytime in 2015 will qualify. If for some reason Congress fails to make the retroactive fix, the payout is taxable, and you can deduct the donation as a charitable gift if you itemize deductions. So only non-itemizers are at risk in the unlikely event the law isn’t reinstated. Businesses in Pennsylvania can receive up to a 90% tax credit by donating to the Educational improvement Tax Credit (EITC) and the Opportunity Scholarship Tax Credit (OSTC) programs. By directing tax dollars your business will already be paying, you can help provide a quality education for students who otherwise would not be able to afford it. The EITC and OSTC PA tax credits allow businesses to make these donations for pennies on the dollar. Hallahan works with representatives from BLOCS to ensure that this process is streamlined for businesses. The process is simple, seamless, and only requires a one page application to be filled out. The Adopt-A-Student program is a four year commitment to provide full or half tuition to a student in need.